I never imagined I’d be able to combine my love for makeup and passion for teaching but here I am, about to have my fourth run of personal makeup workshops this October and November. At first, I wasn’t actively pursuing teaching about makeup application since I was fairly new to the industry as well. 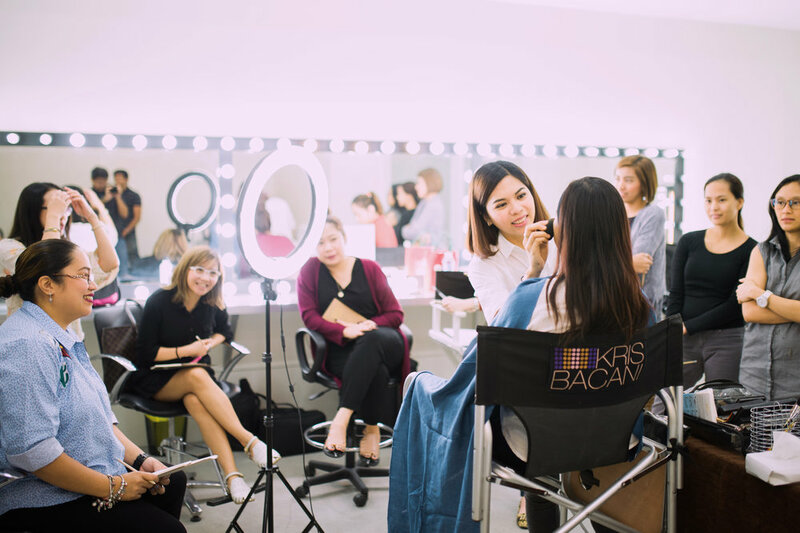 How my makeup workshops came to be stemmed from several opportunities that were presented to me and to which I said a big “YES!” to. I started teaching makeup when I was just a year into the biz. A training company got me to teach basic makeup under their personality development program for different companies. And being a good post-corporate girl, I was armed with my Powerpoint presentation detailing the whole makeup process before doing a demo. I still remember my hand visibly shaking while holding the foundation brush the first time I did the demo in front of 40+ people! Luckily enough, I somehow eventually got the hang of it and started being more confident. The training company even trained me to do the whole personality development module for the succeeding trainings and companies, which helped a lot in building the foundation for my future teaching career. Just a year after that, my makeup school in New York, Makeup Designory, was brought here in Manila. Of course, I was eager to teach in my alma mater. After the interview and teaching demo, the interviewer from US said I did okay but noted that I was too young to be a teacher. I can’t blame them, I was only 24 years old! Fortunately, they took me in anyway and trained me to teach. If the training company developed my confidence, it was in MUD Manila that I developed my love of teaching. It was so fulfilling for me to see my pro makeup students start not even know what brush to use at the start and then eventually graduating to doing whole faces. I was over the moon when I’d eventually see them in Facebook building their own portfolio and getting booked for makeup jobs. My goal for them? Simple. For them to be way better than me. Teaching personal makeup is a whole different story though. I did it for MUD Manila a few times when they were still offering personal makeup workshops, so I never really advertised my own. I did it on my own from time to time whenever some clients asked me to teach them, and that was that. The first time I posted a photo of my workshop online mid last year, I was surprised a lot of other girls were interested. And so, almost a year and 3 series of workshops after, I already have almost 200 students under my makeup brush belt! I realized that teaching for pros and teaching for personal use have two very different approaches (The only similarity in teaching both is like a good artist and teacher who knows her material by heart, I did away with a Powerpoint presentation and left it where it belongs--the office!). Obviously, teaching for pros is a more serious matter, with lesson plans, strict standards, and lots of backaches for my students by standing and working for hours on end. As for teaching personal makeup, I try my best to create a fun and unintimidating atmosphere, all while eating cheese. Lots of cheese. It’s just like having a girly get together, only you leave with fab makeup you didn’t realize you can apply on your own. Coming up with these personal makeup workshops was a huge gamble for me in the beginning but it all paid off seeing how my students--especially the beginners--became so much more confident in doing their own makeup afterwards. And whether I’m teaching pros or newbies, my goal has always stayed the same back from when I started out until now: for my students to be way better than I am.